What’s one of the most common sayings heard when asked the question, “What does eating healthy look like?” Most people say that eating healthy is eating all things in moderation. Do you think this is true? We say this but how many people are eating things in moderation and are overweight, have high blood pressure, high cholesterol, type 2 Diabetes, are fatigued all the time, and have some type of ailment? What does moderation even look like? This may mean once, twice, 3 times a week eating a certain food that is not considered healthy. Maybe it means once a day. This term is broad at best and leaves plenty of wiggle room for people to do as they wish and coat their habits with this statement. The statistics don’t lie. I (Stephanie) have trained many people over the last few years and my observation is that most of my clients ate all foods in moderation. The problem is that our staple foods ate in moderation are cereals, dairy products, refined sugars, fatty meats, and salted processed foods. These foods make us fat and cause disease and ill health. Another problem is all the diets out there. We’ve got low carb-high fat, HCG (for another post), Weight Watchers, Jenny Craig, high carb-low fat, etc. It seems almost everyone is going on one of these diets and losing weight, the important weight our body needs, and then gaining new unhealthy weight back. What’s the solution? What do we need to eat and how can this change your life? Let’s take a look at an average woman’s diet and put this in perspective. Maybe you can relate. Our sample is a 25 year old woman who eats 2200 calories a day on average. For breakfast she eats a danish pastry and 2 cups of cornflakes with 8 ounces of milk, topped with a teaspoon of sugar, and drinks a cup of coffee with cream and sugar. Because of the large amounts of refined carbohydrates consumed at breakfast, her blood sugar level soon plummets and she gets shaky and hungry, leading her to eat a glazed doughnut a co-worker brought in at breakfast, with another cup of coffee. At lunch she heads to McDonald’s near her office and orders a Quarter Pounder, a small fry, and small diet drink. For dinner she eats 2 slices of cheese pizza and a small iceberg lettuce salad with half a tomato, covered with Thousand Island dressing. She washes it down with a soda. What’s wrong with this picture? Well, pretty much everything. 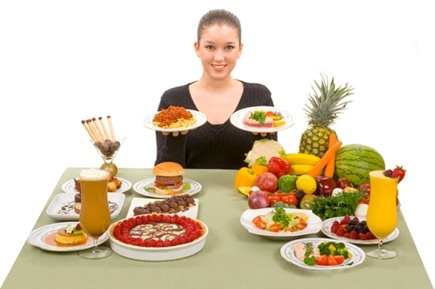 This is only one small example of the typical, modern, processed food-based diet. Her protein intake was 62 grams, which is not very much. On average you should have close to 1 gram per pound of weight you weigh. So if she weighed 150, her protein intake would need to be over 120 grams closer to 150. Her saturated fat content was 29 grams (max should be no more than 20) and her healthy unsaturated fats (poly, mono) were extremely low. Her vitamin B6, B12, and folate were all deficient as well. These prevent a toxic buildup of a substance that damages the arteries and predisposes you to heart disease. Inadequate amounts can also cause colon cancer and the birth defect of spina bifida. Because the average American diet is loaded with refined cereal grains and sugars, it increases the blood sugar and insulin levels in many people. If insulin remains high a collection of health problems occur- type 2 diabetes, high blood pressure, high cholesterol, obesity, and harmful changes in blood chemistry. Now, if you only compared the nutrition facts, some nutritionists would still say this lady’s diet was still in the boundaries of healthy. Her carbohydrates were 55% of her daily calories and her fat was 34%. But the types of foods she ate was a nutritional nightmare. What’s the solution? I suggest we throw out the diet books and most of the government’s food pyramid. They encourage lots of grains and dairy. Most diet food companies use processed food because they can meet “nutritional requirements” for losing weight and replace fat with more refined carbohydrates. This tricks us into thinking we are eating a healthier food. For example, many health related weight loss shakes contain an ingredient called Crystalline Fructose (CF). This ingredient, when researched, is actually very similar to high fructose corn syrup (HFCS). There are only minor differences. CF has less calories but still has the same effects as HFCS. People are drinking these shakes thinking they are doing good for their body when they aren’t. It’s usually the first ingredient on the food label. Even Organically known companies are using this (can give specific names upon request). Our world is a mess and no one knows what to eat partly because of deceptive food companies. We need to get back to the basics of what God designed for us. We need to start eating more of His food again. This means limiting grains, and dairy (dairy will be discussed another day). But this also means eating a higher content of healthful meats and lots of fruits and vegetables. Studies and research are proving over and over that going back to a diet high in lean meats and whole foods is the very best for us. So should we eat all things in moderation. My answer is, no. Sugary, salty, processed food is down right addicting. That’s why I stay away from potato chips and soda. I have no need for it and they are both very addicting. They cause chemical reactions that make me WANT MORE foods like it. My body is no longer satisfied with healthy fruits and vegetables and wants cookies and bread. Do I still eat grains and dairy? Yes. Eating pizza will probably never leave my diet and I enjoy a good homemade biscuit at times. But how much and how often I eat those things is what I need to caution myself with. My goal is to continue removing more foods like those. I notice a huge difference in the way I feel when I eat them vs. when I don’t. There are some people who cannot eat certain meats and there are exceptions. But a majority of the population does not fall into that category. Most are unhealthy because of eating a diet low in lean protein, fruits and vegetables and high in grains and dairy. Transforming your body into a healthy lifestyle is the goal and that means adjusting. Hopefully you are encouraged by this information and have a better handle on what may be causing you issues or how to change some food habits. There will be much more to come on these topics with explanation in greater detail. For now, look at what you’re eating and start making adjustments. We all have room to grow.